China’s state-run media has been even more caustic. Recalling the Western military interventions in Afghanistan in 2001 and in Iraq 2003, The People’s Daily noted what it sees as a pattern of Western interference in other countries’ internal affairs. One commentary warned, for example that, ‘The blood-soaked tempests that Iraq has undergone for eight years, and the unspeakable suffering of its people are a mirror and a warning’ of what might ensue should the West persist in its military operations in Libya. With feelings running so high, Beijing and Moscow might have been expected to block Resolution 1973, or at least do more to ensure that Western powers were more tightly constrained in their use of force. After all, both governments strongly support traditional interpretations of national sovereignty, which severely restrict the right of foreign powers or international organizations to intervene in a country’s internal affairs. So why didn’t they? Certainly it wasn’t because there was a widespread belief among Chinese and Russian policymakers that the Western initiative was really based on the humanitarian reasons proffered by NATO. Indeed, to Russia and China, such justifications over Libya bore a striking and uncomfortable resemblance to the arguments used over intervention in Kosovo. Back then, the coalition decision to provide military support to the separatists in Kosovo (who also claimed to be democrats) held the disturbing implication that the United States might also intervene militarily to defend Taiwan and Georgia against attempts at forceful reunification, or to support separatist aspirations in Chechnya, Tibet, or Xinjiang. It’s a line of thought that is likely no different under current circumstances. In addition, China and Russia ultimately want to create a multi-polar international system in which the United Nations and international law dominate decision making on all important questions, including the possible use of force. In recent years, Chinese and Russian officials have led the opposition against imposing rigorous sanctions on Iran, North Korea, and other countries that have pursued policies that Western governments consider violations of international laws and norms. The fact that both China and Russia—and in particular, their government agencies and nominally independent private defence trading companies—have been sanctioned on numerous occasions by the United States and its allies has likely contributed to their distaste of such measures. It therefore took some considerable skilled Western diplomacy to persuade Beijing and Moscow that it was in their interests to at the very least acquiesce in the West’s military campaign in Libya. Their task was made easier by the fact that they had taken time to secure regional support for the move. But Western diplomats also recalled that in 2005, China and Russia both supported a landmark UN resolution endorsing the ‘responsibility to protect’ policy. This principle encourages the international community ‘to protect (a state’s) population from genocide, war crimes, ethnic cleansing and crimes against humanity’ if a government is unwilling or unable to protect its people. This fact, combined with Arab League and African Union support for intervention, made it easier to secure Chinese and Russian acquiescence in the Security Council. Still, there were good reasons for thinking that a China clearly nervous that the wave of social revolutions sweeping the Middle East this year would spread east, would offer more resistance. The Chinese government and media has limited its coverage of these unfolding events, and when they did offer commentary on the upheavals, they stressed the need for stability and called on foreign governments to refrain from interfering in the process. The Russian media was less constrained, but like Chinese coverage, gave great play to new government measures to improve social welfare and otherwise address possible sources of mass discontent. In addition to limiting Western influence, China and Russia doubtless didn’t want to alienate Middle Eastern regimes with whom they have cultivated valuable energy and other economic ties. 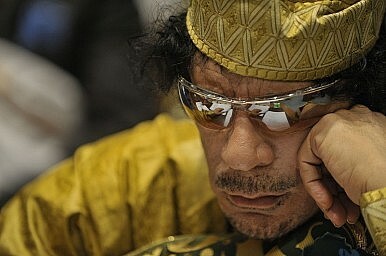 The Gaddafi government has indicated that it will now consider offering oil block contracts directly to China and other countries that have supported it against the rebels, while Chinese diplomats have increased their activities in the Middle East and North Africa since the Arab Spring began in an effort both to better understand developments in the region and to ensure that Beijing maintains good ties with any new regimes that come to power. Yet eager as they have been to avoid inflaming Muslim opinion, Beijing and Moscow clearly saw the risk of straining ties with the West as an even bigger danger. After years of attempting to reassure the world about its peaceful rise, the past year has seen a number of missteps in Chinese foreign policy, including a series of provocative acts over border disputes. Stung by the criticism it has received, and keen not to exacerbate tensions with the United States in particular any further, China apparently decided not to stand in the way of the West’s intervention. Russian officials, meanwhile, want to continue to ‘reset’ relations with key Western countries that have only recently begun to recover from the Russia-NATO freeze that followed the August 2008 Russia-Georgia War. Evidence of this new mindset is clear from the fact that not only did China and Russia decide against exercising their Security Council veto, but they have also declined to coordinate their opposition to Western policies in Libya. So far at least, cooperation has merely consisted of government officials citing each other’s opposition to reinforce their own complaints. Maybe. But either way, if the United States and other NATO members want to ensure there is no lasting diplomatic fallout over the Libyan issue, they will need to keep their military operations in the country modest, lest they further antagonize a disgruntled China and Russia. And, of course, such limited means are in any case appropriate for a war that is supposedly being waged for limited ends, as part of a conflict where there are clearly no vital national interests at stake for the coalition that is waging it.